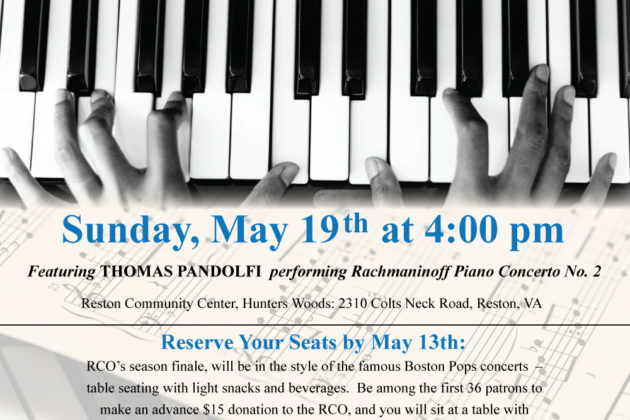 The Reston Community Orchestra’s 31st season finale concert, Delicious & Delectable, will be performed on Sunday, May 19 at 4 p.m. at the Reston Community Center Hunters Woods, Reston, Virginia. The concert will be in the style of the famous Boston Pops concerts and will feature pianist Thomas Pandolfi performing the most popular composition by Sergei Rachmaninoff, Piano Concerto No 2, in C minor. To reserve seats you can either visit www.restoncommunityorchestra.org and use the PayPal button or you can send a check made out to “Reston Community Orchestra” to: Reston Community Orchestra P.O. Box 2331, Reston, Virginia 20195. Seats must be reserved by May 13.